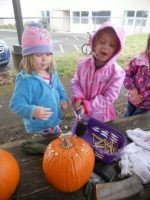 A 9000 square foot outdoor space at St. Andrew Preschool and Kindergarten now is home to a new Nature Explore Classroom. 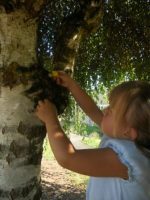 Each day, children have the opportunity to learn and grow in a space that connects them with nature. Fortunate to have a mature Douglas fir and mature cherry trees in the outdoor classroom, space has been divided into different areas using upright logs, planting materials and different types of surfaces. Three weeping birches have been pruned to help with visibility while still maintaining a cozy space for the children. 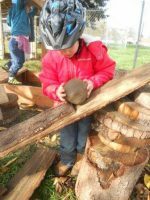 This Nature Explore Classroom started with a beautiful space and was enhanced with many native and ornamental plants and natural elements including a grape arbor, balance logs, stepping logs, and lovely gathering area under the large fir tree. A gate was added between the new community garden and the outdoor classroom to invite children to explore the Nature Explore Classroom while their family is gardening. A paved path makes the area accessible for wheelchairs. 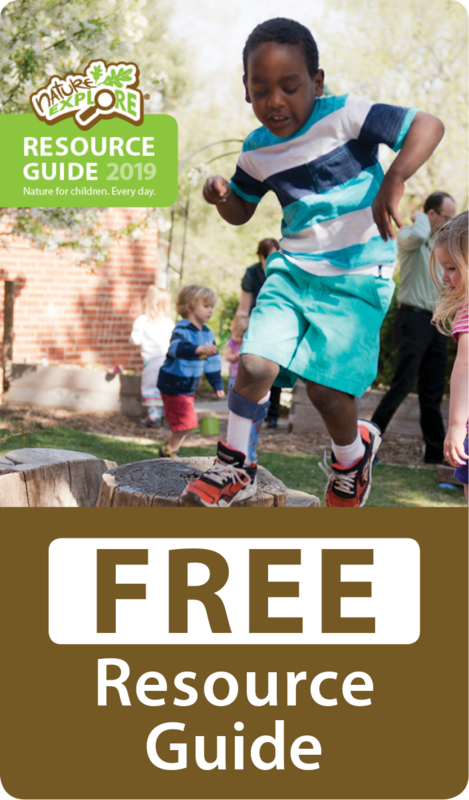 An open grassy area invites students to use large movements in the space while a large open sand area provides a different tactile experience from the usual dirt and woodchips. A sensory garden was planted in the classroom which contains a variety of herbs. 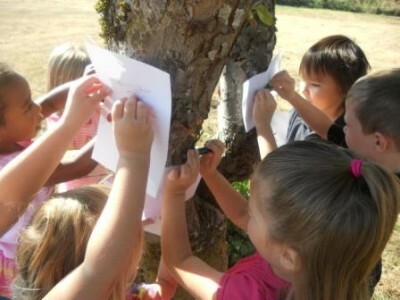 The preschool has a plot in the community garden where the students engage in hands-on learning. The building area utilizes natural tree blocks, planks and tree cookies. St. Andrew Preschool and Kindergarten is part of the ministry of St. Andrew Lutheran Church. A wooden boat was included near the open sand area to represent St. Andrew, who was a fisherman. The entire outdoor classroom is very low maintenance. The landscape designer worked with suggested durable planting materials to help with this goal. Grassy areas are mowed weekly during the growing season and window planter boxes and labyrinth are weeded as needed by parent volunteers. Several areas were completed in conjunction with an Eagle Scout project. Local businesses contributed construction materials. 69 people worked a total of 385 hours for that project alone with additional work days organized during the summer and fall. A parent meeting was held at the beginning of the school year with parents touring the outdoor classroom, getting to know the space and the materials available for exploration. St. Andrew also offers a free playgroup that is open to anyone in the community. 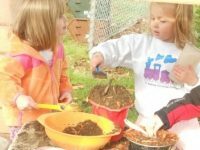 Staff scheduled a viewing of the Learning With Nature DVD for the preschool parents and frequently includes descriptions of how the children are using the outdoor classroom in school newsletters and on their Facebook page.